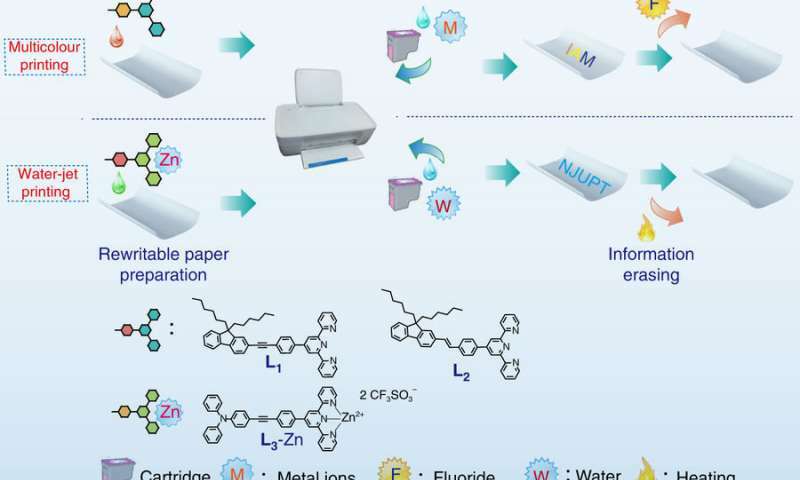 A team of researchers with Nanjing University of Posts and Telecommunications, Nanjing Tech University and Northwestern Polytechnical University, all in China, has developed a new type of paper that can be erased and printed on multiple times. In their paper published in the journal Nature Communications, the group explains how they made their paper, how well it works and the ways they are looking to improve it. Paper that could be erased and reused would contribute to protecting the planet—paper production produces pollutants, and the search for new sources of wood for paper production has led to deforestation around the world. While the paper developed in China will not likely change that, it does suggest that chemists might be getting closer to a replacement product.